In recent years the size of megapixels on digital cameras has been slowly increasing. Today, hundreds of digital camera models are over 10 megapixels. An obvious advantage of having greater megapixels is the possibility of printing images in larger size. Meanwhile, most people still print photos in format 10 x 15 cm, the bigger the better is not always the case, at least in this instance. 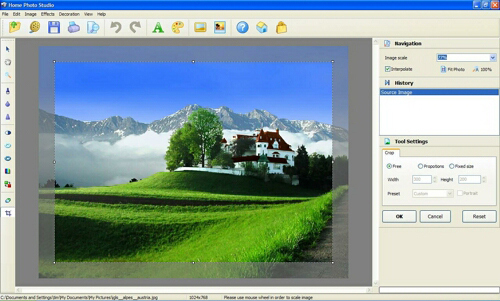 If you are accustomed to printing your photos without editing them with photo editing software, it would make sense to remember the basic methods of preparing photos for printing. But, if you love to edit photos before printing, then this lesson is definitely for you! Upload your pictures photo hosting websites such as Flicker. Post your picture on any website or blog. Save and archive your pictures for future generations. Use your favorite photographs as wallpaper on your desktop. 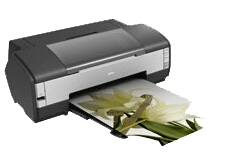 Print photographs on your home printer. Print at your local photo store or kiosk. Should you change your pictures image size? You only need to keep the original image size if you are archiving your picture, and plan to use them in the future for something that may require a bigger and higher quality image. In all other cases, you know the correct size you need in advance. Remember The bigger the image size, the bigger the file size, thus requiring more and more memory. Keep in mind that reducing a pictures size does not mean you won’t be able to print photos with high quality, unless you reduce the image size too much. For example I have a 3000 x 2000 pixels size image and I need to print a 3 x 5 picture, I only need 1,200 x 900 pixels to print photos with high quality. Therefore, before you start editing the actual photograph, it is recommended that you edit and reduce the image size first. Make sure you save the original image before you start your editing, this will act as a safety net for you, incase you screw up the image your editing. Reducing your image size will also significantly expedite the saving or burning to CD/DVD process, because the image size will be less. If your going to be using your pictures in a digital format, for instance online “Facebook” “MySpace” or your computer “wallpapers”, the size should be set in pixels. If you’re going to print a photograph then the size should be in inches or centimeters. 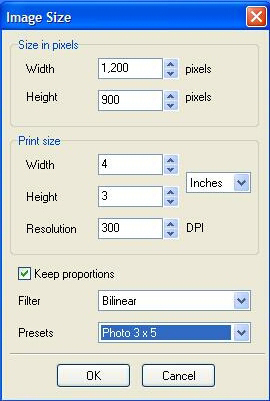 After selecting the correct size, you may choose to enhance your picture with specific filtrations. In selecting the proper filtration effect see our recommendations below. 1. If your photograph is un-sharp or blurry, choose the option "No Filtering". So focusing errors will be noticeable to a lesser extent. 2. If the picture has some defects such as noise, or any details that are better disguised, choose option "Spline". 2. In all other cases, select "Bicubic" or "Bilinear" filter. Most amateur digital cameras have the aspect ratio 3:4. One of the most popular formats for printing images is 10 x 15 and its aspect ratio is 2:3. As a result, a beautiful photograph with correct composition can be cut in places during printing; basically the edges of the photograph above and below will be cut off. How can this be avoided? Select from top menu: Image> Crop. From the sidebar select "Proportions" and enter the proportions you need, you can manually input them or there are presets available. This way you can print photos with high quality by predefining the correct proportions to forgo any printing errors. You may also want to check out How to Crop a Photograph tutorial.